Pakistan conducted its first census in 19 years in July. All the results have now been released, except those on religious minorities. The government has provided no explanation. 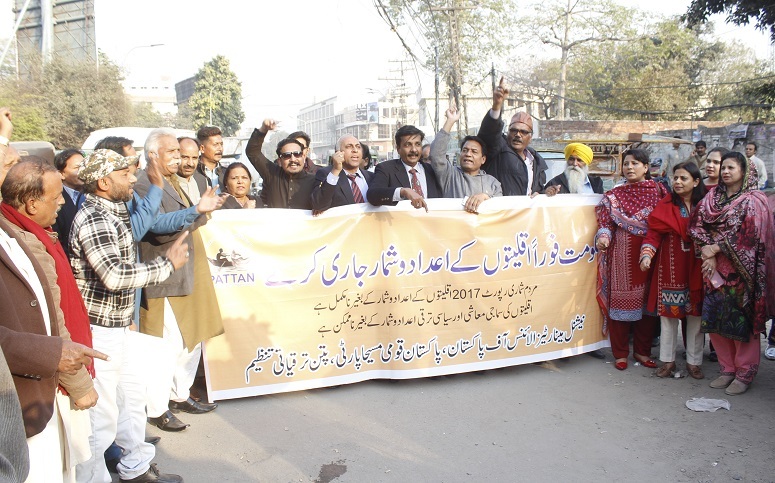 On 22 November a small group of protesters, mostly Christians, gathered outside the Press Club in Lahore, the major city in Pakistan’s Punjab province, threatening to protest every day until the data is released and to take the matter to the Supreme Court if it isn’t released before Christmas. Pakistan was founded in 1947 as a homeland for Muslims of the Indian subcontinent, who were back then a minority and were socially and economically behind the Hindu majority. The country is a republic with Islam its state religion. Religious minorities, including Christians, make up only 3 to 5 per cent of the total 207 million-strong population, but their citizenship and even political representation in assemblies are highly contested topics – non-Muslims are prevented by law from becoming the Prime Minister or President. Meanwhile Pakistan has the most notorious blasphemy laws in the world – and they have been used disproportionately against religious minorities. Pakistani Christians make up only 1.5 per cent of the total population, but over a quarter (187) of the 702 blasphemy cases registered between 1990 and 2014 were against Christians. 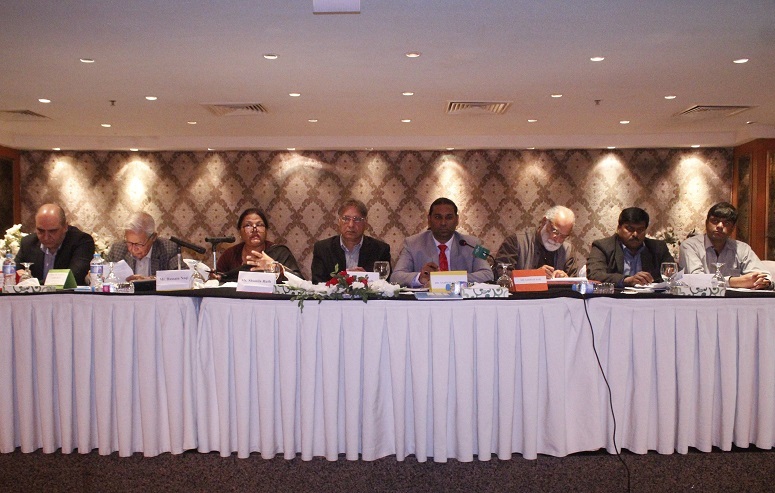 Pattan, the non-governmental organisation that organised the protest outside the Press Club, held a consultation on the same day at Lahore’s Hospitality Inn, titled ‘Shrinking Political Space for Minorities’. At the consultation, Government College University Vice Chancellor Prof. Dr. Hassan Amir Shah stressed the need to review school textbooks to provide students with a balanced worldview. “Academics and scholars are consulted but in the end of the day it is the state machinery which decides the future of the country,” he said. 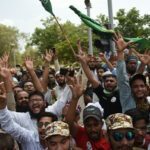 Punjab Deputy Inspector General (Operations) Amir Zulfiqar Khan said the biggest challenge facing police is making Pakistan’s large Muslim majority realise the non-Muslim minority are equally Pakistani citizens. He added that, contrary to what most people believe, incidents of violence against minorities are mostly sporadic, unplanned and uncoordinated, and that often they are motivated by vested interests. He also said that the number of communal attacks on religious minorities has decreased in recent years. It was also the year when military dictator General Muhammad Zia-ul-Haq introduced an electoral system which allowed minorities to choose their own representatives, but forced them to vote only for members of their own religious group. After Pakistan’s constitution was framed in 1973, the next year a constitutional amendment was passed declaring Ahmadis as “non-Muslims”. After this designation, minorities’ seats were created to give Ahmadis political representation. General ul-Haq’s electoral system continued until 2002, when another dictator, General Pervez Musharraf, changed it so people were no longer forced to vote along religious lines. Pattan National Coordinator Sarwar Bari noted that the first constituent assembly of Pakistan had 24 non-Muslims out of 69 (over a third), but that today the minority representation in assemblies has dipped to less than 3 per cent. Right after the founding of Pakistan in 1947, founding father Muhammad Ali Jinnah appointed a Hindu of the lowest caste, Jogindar Nath Mandal, as the law minister, and an Ahmadi, Sir Zaffar Ullah Khan, as the foreign minister. Such a liberal approach would be unthinkable in today’s Pakistan. Pakistan has had a bumpy ride on the road of democracy – in the 70 years since its independence, almost half of that time has been spent under military dictators. Minority seats are allotted to political parties on the percentage of general seats they secure through voting. Christian community leaders like Catholic Archbishop Sebastian Shah, Centre for Human Rights Education-Pakistan Director Samson Salamat and Chairman of Pakistan Minorities’ Unity Council Zahid Nazir Bhatti say minorities should be given the right of a duel vote: to be able to vote for Muslim candidates in their constituencies and also minority candidates, who are currently chosen by political parties in local, provincial and national governments. However, Centre for Social Justice Executive Director Peter Jacob raised concerns over the direct-voting mechanism for religious minorities. “Direct voting – even if minorities are allowed to vote on general seats in addition to minority seats – would lead to separate voting lists,” he told the consultation. “We have seen no development and huge segregation when General Zia had us separated from mainstream politics. Punjab Assembly Christian parliamentarian Shahzad Munshi said he had been petitioning for the constitution of a Minority Commission, where the issues facing minorities could be discussed and the state could be mobilised to address them. “However, the bill has been pending with the Human Rights and Minority Affairs for almost a year now,” he said. He stressed that the sooner the commission is created, the sooner minorities will be able to present such concerns to the government in a more formal way.